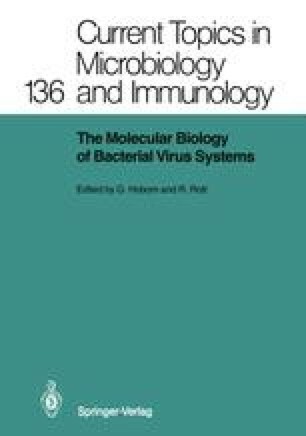 Since the rediscovery of bacteriophage ø X174 in the 1950 s by Robert Sinsheimer (1959), the single-stranded DNA phages have been widely used as model systems in molecular biology. ø X174 can be considered as their “ godfather. ” The single-stranded DNA bacteriophages are divided into two classes based on the morphology of their representatives, either isometric (icosahedral) or filamentous. The isometric phages follow the conventional infection cycle of adsorption, reproduction, and release of progeny particles after lysis of their host, usually Escherichia coli C. The other class, the filamentous phages, do not lyse or kill their host cell. The infected cell continues to grow and to divide, while the progeny virions are formed and extruded through the cell membrane in a continuous fashion. Both classes of single-stranded DNA phages contain a circular genome.